NEWTON – Victoria and Argonia-Attica were tied at 28 in the final seconds of the Eight-Man, Division II state championship game Saturday. The Knights faced fourth-and-inches from their own 24-yard line. Victoria decided to go for it. Senior quarterback Brady Dinkel’s goal was simply to gain the first down. He took the snap, ran to the middle, saw a crease and then bolted to the right and raced down the sideline. Dinkel outran the Titans’ defense and crossed the goal line with two seconds remaining for a 56-yard touchdown. Dinkel tacked on the two-point conversion. A&A’s kickoff return featured several laterals but fell short. Dinkel and Victoria capped a remarkable season and a game for the ages with a 36-28 victory at Newton’s Fischer Field. Victoria finished 12-0 and won its seventh state title in school history. The Knights beat the Titans for the second straight season in the finale and captured back-to-back crowns for the first time in school annals. This season joins the 1988 season as the lone perfect seasons for Victoria. Tenth-year Victoria coach Doug Oberle, now 3-1 in state games as a head coach, said he had never been a part of a more exciting finish. Dinkel, all-state at quarterback and safety in 2014, played well in a big Week 1 victory versus Central Plains. A few hours later, he was hospitalized and then life-watched to Wichita with internal organ problems. Dinkel wasn’t expected to come back. Senior Joe Dortland stepped in admirably for seven games and remained at quarterback when Dinkel came back in Week 9. Last week, Dortland broke his collarbone and didn’t play again after the first two snaps at Wallace County. Dinkel came back under center. On Saturday, he rushed 11 times for 173 yards and four scores, including a 79-yarder in the final seconds of the first half. He finished 6 of 11 for 70 yards and another touchdown. Last year, the Knights dominated the Titans, 52-8, in the title game. This season, A&A had increased depth, much improved defense, the addition of transfer Jacob Norris and senior quarterback Alec McDaniel again playing at a high level. The Titans are now 5-4, 12-1 and 12-1 since they started the football co-op. The game was tough and physical all contest. A&A leading rusher Devon Newberry left with 9:36 remaining in the third quarter and didn’t return. Two plays before Newberry suffered the injury, Victoria all-state lineman Eric McAlonan left with a knee injury. He eventually returned, delivered a late sack and ended the contest with a special teams tackle. A&A had several players cramping, and Knight junior linebacker Bryant Karlin had several open cuts on his face. McAlonan had tears in eyes in the postgame celebration. Victoria never trailed and led 28-14 with 11 minutes, 20 seconds left. However, the Titans controlled the majority of the second half. The Knights had one third-quarter first down, on the quarter’s final play. A&A ran 41 second-half plays, 22 more than Victoria. The Titans tied the game on a 3-yard, inside slant on fourth down from McDaniel to senior Kolten Koerner. McDaniel had to handle a bad snap that rolled back to him before he threw to Koerner who made a great catch. Koerner then caught the two-point conversion to tie the game at 28. McDaniel, held to minus-11 first half yards, finished with 26 carries for 71 yards. He completed 17 of 30 passes for 211 yards with four touchdown passes. 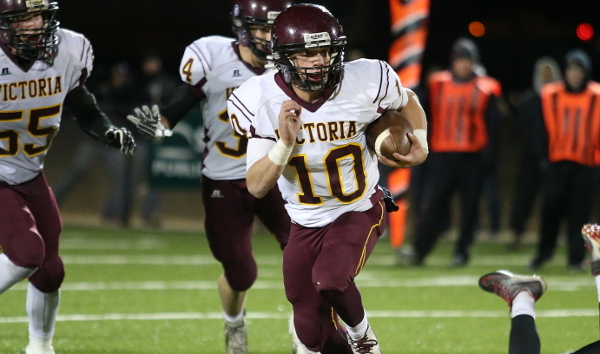 A Victoria turnover and A&A punt gave the Knights possession at their own 15-yard line with 35 seconds remaining. An incomplete pass and nine-yard run by sophomore Collin Kisner set up 3rd-and-1. Senior Parker Riedel carried the ball and came up just short of the marker. A measurement confirmed Victoria was only inches away. On the next snap, Dinkel completed a historic season with a memorable run.